Definition at line 17 of file Ip.h. Definition at line 542 of file Ip.cc. Definition at line 544 of file Ip.cc. Decode an ascii representation (asc) of a IP netmask address or CIDR, and place resulting information in mask. This function should NOT be called if 'asc' is a hostname! Definition at line 156 of file Ip.cc. References Ip::Address::applyMask(), Ip::Address::cidr(), DBG_CRITICAL, debugs, Ip::Address::isIPv4(), and Ip::Address::setNoAddr(). Definition at line 209 of file Ip.cc. 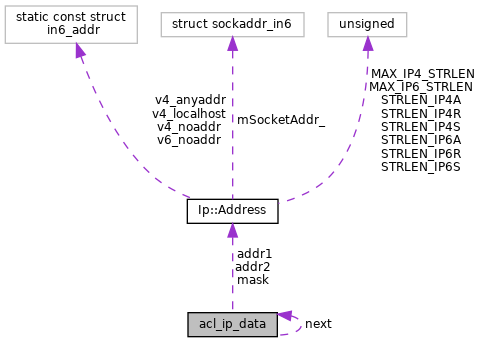 References acl_ip_data(), addr1, addr2, addrinfo::ai_flags, Ip::Address::applyMask(), Ip::Address::cidr(), DBG_CRITICAL, DBG_IMPORTANT, debugs, DecodeMask(), Ip::EnableIpv6, freeaddrinfo(), gai_strerror(), getaddrinfo(), HERE(), LOCAL_ARRAY, mask, next, NULL, SCAN_ACL1_4, SCAN_ACL1_6, SCAN_ACL2_4, SCAN_ACL2_6, SCAN_ACL3_4, SCAN_ACL3_6, SCAN_ACL4_4, SCAN_ACL4_6, self_destruct(), Ip::Address::setAnyAddr(), Ip::Address::setEmpty(), and Ip::Address::setNoAddr(). Definition at line 121 of file Ip.cc. References aclIpAddrNetworkCompare(), AclMatchedName, DBG_CRITICAL, debugs, MAX_IPSTRLEN, and toStr(). Definition at line 72 of file Ip.cc. print/format an acl_ip_data structure for debugging output. Definition at line 41 of file Ip.cc. References addr1, addr2, buf, Ip::Address::cidr(), Ip::Address::isAnyAddr(), Ip::Address::isIPv4(), Ip::Address::isNoAddr(), mask, NULL, and Ip::Address::toStr(). Referenced by NetworkCompare(), and toSBuf(). Definition at line 31 of file Ip.h. Referenced by aclIpAddrNetworkCompare(), FactoryParse(), ACLIP::match(), and toStr(). Definition at line 33 of file Ip.h. Definition at line 35 of file Ip.h. Definition at line 37 of file Ip.h. Referenced by FactoryParse(), and ACLIP::parse().